Aberdeen, 13th May, 2015. Unique Group are pleased to announce the delivery of the first purpose built dive support Daughtercraft to the North Sea for Vertech, part of Global Energy Group (GEG). The Hydracraft 1500 Daughter Craft vessel, named Vaila, is nearly 50ft long and is fitted with the very latest Hydra dive support systems from Unique Group’s Diving Equipment division. 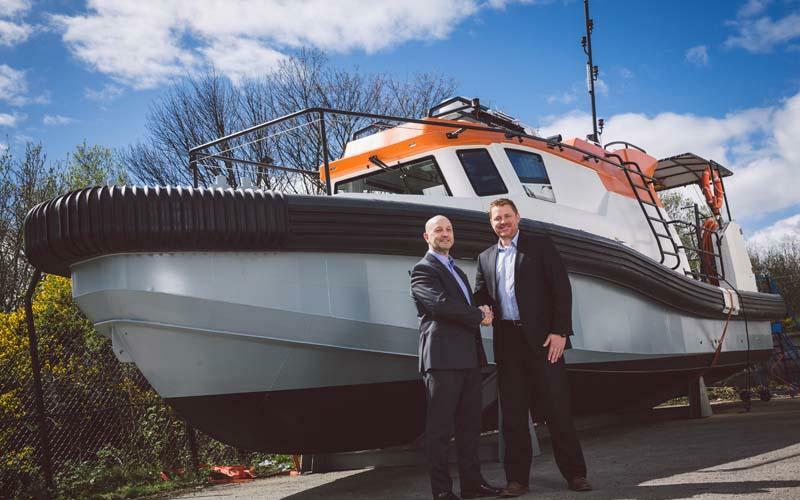 Unique Group’s UK Managing Director, Ray Hughes, handed the vessel over to Vertech’s UK Managing Director, John Marsden, and Vertech’s Diving Manager, Alan Melia in Aberdeen on the 7th May 2015. The Vaila is the first Daughter Craft which has been built for purpose, from concept through to design, where before other vessels used for the same purposes have been conversions of existing craft. The Daughtercraft system is designed for conducting diving operations for underwater inspection in locations otherwise inaccessible by larger vessels. The project was initiated when Vertech (under their previous identity, Global Energy Group) formed a new commercial diving entity. They approached Unique for surface diving systems and so the concept development for the Daughter Craft began in May 2014. Talking about the project, Ray Hughes said, “Delivering the Daughter Craft to Vertech has been a magnificent achievement for Unique Group. We have worked closely with our client, ensuring the design and operations of the vessel are first class. It is essential that the craft and its associated equipment provide a safe and comfortable working environment for the divers and crew onboard. John Marsden commented, “At Vertech it is really important that we provide our Client’s with the very best safety performance, service, and value. The dive systems we have purchased from Unique Group are a key part of this, the systems themselves are well proven with a good track record. They have been designed to meet our onerous specifications and incorporate all the latest recommendations from IMCA. This kit is state-of-the-art and the service we have received from Unique has exceeded our expectations." The Vaila can hold a maximum of 10 people and will be based at a North-East port, with the ability to deploy anywhere around the world. It has its own single launch and recovery system, the Macgregor G150 Davit, which is the largest lifting davit manufactured by Macgregor to date.